The Bixolon SLP-T400 is the most comprehensive, cost-effective thermal transfer label printer on the printer market today. This easy-to-use, low-maintenance printer reduces training requirements and operating costs, and provides a flexible solution through a variety of options and accessories. Connect the SLP-T400 to a PC using either Serial, Parallel or USB. Samlabel, user friendly software allows easy creation of labels. Height: 200mm Depth: 310mm Width: 214mm. 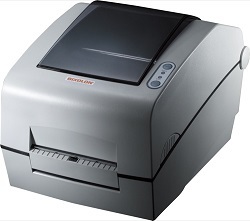 Click the button below to add the Bixolon SLP-T400 Thermal Label Printer to your wish list.